The Danish Design Luxe Range of dog beds offers a touch of luxury with a velvet feel. Lynx fake animal fur print. Deluxe slumber beds are circular shaped featuring deep filled and quilted fibre shoulders for extra comfort with a matching fibre filled removable mattress. Access is easy via the deep front opening. The complete bed is fully washable. Foam filling is fire retardant. 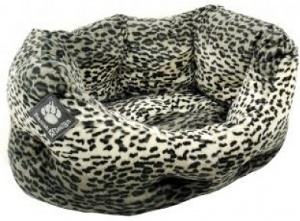 Extra large dog bed in sizes: 35" or 40" (width of base).